I can understand why political commentators would assume that the party is in some turmoil and there is always the past reality that smaller parties supporting Labour or National led Governments have suffered electorally (the Maori Party is the most recent example). I can also understand while some may think that the Green Party lacks internal discipline when there appears to be open questioning of MPs and Minister's decisions and a good deal of emotion in social media comments. I actually celebrate that I am a member of a party that has a good deal of internal debate and members expressing passionate views. This is a sign that the party is alive and healthy and full of members who who feel passionate about environmental and social issues. Our MPs are held to account and bringing about change to the neoliberal systems that have devastated our environment and communities is a common driver. Most of the internal debates are around the speed of change and the levels of compromise on this journey. Eugenie Sage's dilemma is useful to highlight what many Green members are grappling with. Eugenie has the experience and knowledge to make a very competent Minister of Conservation and Land Information and an Associate Minister of the Environment. She studied Law, History and Journalism at University and was a member of ecology Action and Friends of the Earth. 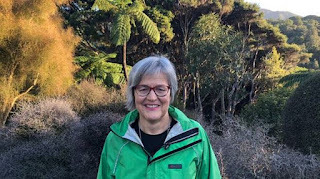 Her years as a Forest and Bird Field Officer and Environment Canterbury Councillor gave her a good understanding of the issues related to her current responsibilities. For Eugenie the threats to our natural environment are very real as she has often physically engaged with the very places that are being compromised by human activity (unlike Simon Bridges who made sweeping decisions about places he had no knowledge of). When there was a proposal to build a monorail through Fiordland when she was in opposition, Eugenie walked the route so that she understood what the impacts would be first hand. I have also kayaked with her on a local Estuary where research had revealed increasing levels of eutrophication. As Minister of Land Information, Eugenie Sage was confronted with a land purchase request that would allow a large, overseas water bottling company to expand its plant. Given the fact that it was paying no royalties for the New Zealand water it was exporting and was an industry the Green Party had campaigned against, the decision wasn't taken lightly. The Overseas Investment Act requires benefits for New Zealand to result from any overseas proposal but does not require environmental considerations. Given the jobs that were proposed and the economic benefits for the local community, Eugenie was constrained by her Ministerial responsibilities and approved it on principle. If Eugenie had done what many members would have wanted and rejected the request, the legal consequences could have been considerable and the fallout, substantial. The law needs to change to allow royalties to be charged and to have environmental considerations included in decisions. Eugenie is an experienced politician who looks at the long game, she is fully aware that there are likely to be numerous decisions that she will be obliged to make because of the constraints she is bound to work within as a Minister. However, it will be a lot harder to change the rules if she loses her ministerial positions. Past ministers from other parties have found the right decisions too difficult to make and often sat back and enjoyed the baubles of office and the privileges that come with the role instead. Retaining power appeared all-consuming and pandering to lobbyists can make life so much easier and personally rewarding (box seats at rugby games). Jonathan Coleman was a great example of a Minister who actively ignored the issues confronting the health sector he was responsible for and did the least possible. As soon as he lost the power he revelled in, he abandoned ship and quickly gained a position in the private sector where he was rewarded for his disregard for public health. During his time as Minister of Health I was never aware of National Party members voicing any concerns regarding his incompetence or lack of compassion. He even had the audacity to run for the leadership of the party. Where were National Party members when it was revealed that Murray McCully paid an $11 million bribe to a Saudi farmer? Where were the members when National cut around $2 billion from the early childhood education budget since 2010? Where were the National Party members when National closed schools in Christchurch using an appalling process and causing great emotional damage to vulnerable children, families and staff? It is not such a privileged life for Green Party ministers, they are expected to pay 10% of their salary back to the Party and be fully transparent about their expenses. I can't imagine any Green Minister making a lot of use of the Government limousines and public transport is used where possible. The Party's democratic processes allow members to rank and elect leaders, none are placed on a pedestal and all will have their performance scrutinised against Green policies and kaupapa. It is hard to rein in passion when members care deeply about important issues and there is a pervasive feeling of urgency to set things right as soon as possible. While I wish some were a little more circumspect, criticism is healthy. No one will be assessing Green Ministers' performances as strongly as the party itself and that is as it should be. It's not easy being Green and even harder being a Green Minister. Post Script: After receiving a good deal of flack for her previous decision Eugenie is now receiving criticism for blocking the expansion of coal mining on the West Coast. Back her up in public instead of wriggling round the hate campaign. I do, Tom. I did so here and I actively defended her in social media. One thing that could help in future is to front foot difficult decisions by communicating the background and ensuring that people are more knowledgeable before angrily putting fingers to keyboards.